It is Jazz Fest time here in New Orleans. I didn’t get to the Fairgrounds at all on the first weekend, but still heard some great music, and made some fun music as well. 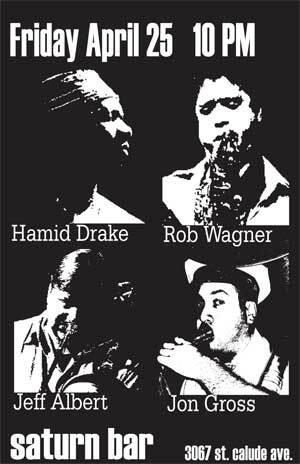 Hamid Drake was in town playing in various settings with Rob Wagner. 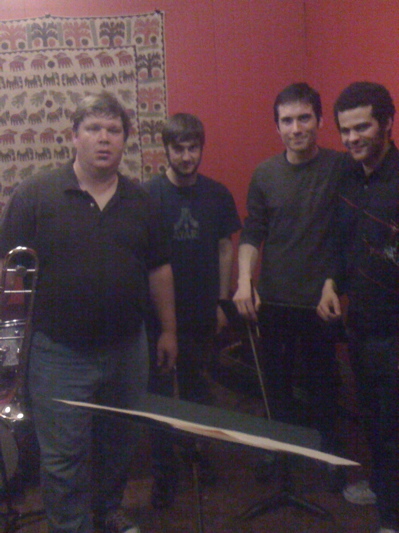 On Friday night at the Saturn Bar, tuba player Jon Gross and I were one of the various settings. Rob wrote some new music for the group. I don’t know that I would call them tunes, but they were great improvisational mood setters. That night, I learned that one of the secrets to living a happy life, is to play with great drummers. Sunday night was my first visit to the new Zeitgeist space, and it is quite nice. It sounds great, and is nicely appointed in a minimalistic sort of way. The first show that night was James Singleton and friends, with Larry Sieberth on piano, Scott Bourgeois on alto sax, Helen Gillet on cello, Justin Peake on drums and laptop, and of course James on bass…and cornet. James’ cornet playing has come a long way. He is starting to really make the thing sound pretty good. The set was largely improvised, but there were also appearances by some of James’ composed material. The later show that night at Zeitgeist was a group that I put together to feature Dan Godston, who was visiting from Chicago. It ended up being larger than anticipated, and lots of fun. I enjoy large groups of well behaved improvisers almost as much as small groups of poorly behaved ones. I played Dan’s slide trumpet for a bit. That was a trip. It is likely that all or part of that set will end up posted on jeffalbert.com at some point fairly soon. As a side note, Zeitgeist will host an 8 week creative music series, running every Tuesday from late May into July. I believe that it will be curated by Helen Gillet, which should be very cool. Later Sunday night, I went to the Dragon’s Den to hear Rob and Hamid in the trio from the CD, with Nobu Ozaki on bass. I ended up sitting in for a good chunk of the second set, along with Cocheme’a Gastelum on alto sax. Cocheme’a is a friend of Hamid’s, who was in from NY for Jazz Fest. He sounded great, and the three horn texture brought out some nice aspects of Rob’s tunes, that don’t always make themselves obvious in the trio format. The conclusion of the first weekend was actually Monday night at the Big Top, with the Peter Brötzmann/Han Bennink duo show. 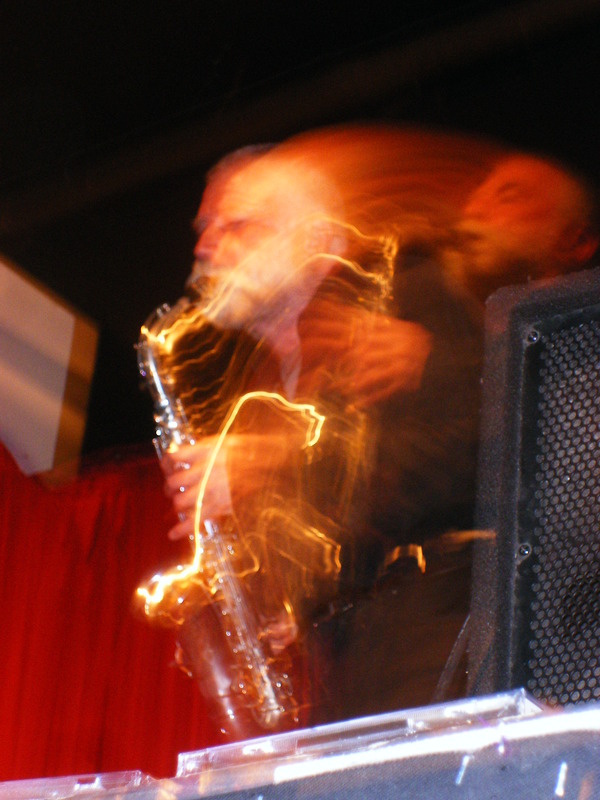 I think Brötzmann’s playing is evolving, and I know my listening is evolving, because everytime I hear him live, I get it a little bit more. He played some very earthy rich melodies Monday, but I am also starting to hear more of the melodies contained in the flurries of noise as well. Mr. Bennink (as Brötz referred to him) was as impish as usual. Han played the encore on a wooden stool as he sat on the floor in front of the stage, causing Peter to give in a little and take a seat on the edge of the stage. The music was great. They make a wonderful duo. Photo courtesy of John Sharappa. 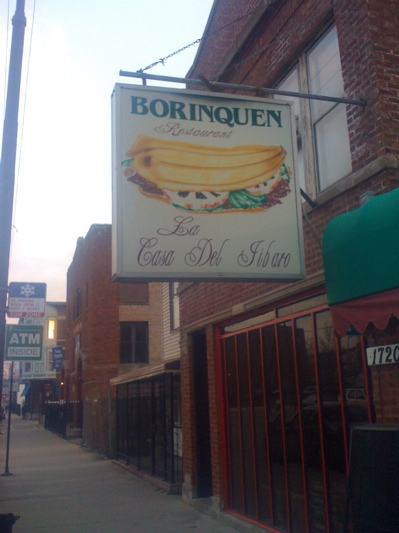 Our first stop was for a jibarito (or jibaro) at this place: on California. A jibaro is essentially a steak sandwich, but instead of bread, it uses fried plantains. This ROCKS! Most excellent. Seasoned just right, and slammin’. Rob and I split one, because there were a few more places on our list, and I had to play later. 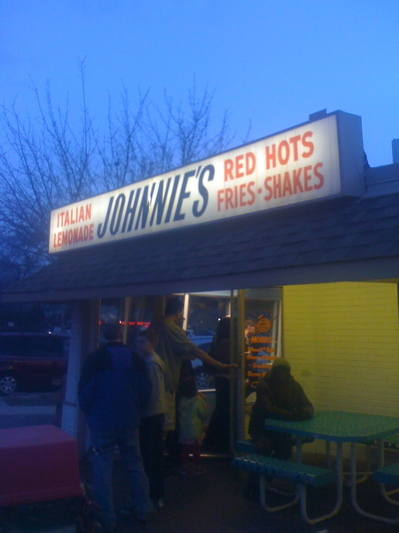 Our next stop was supposed to be for tacos, I believe, but the place was closed, so we moved west to Johnnie’s for an Italian beef. I had a combo (which is beef and sausage) with sweet peppers, and an Italian lemon ice. This stuff is heaven. Texturally, it reminded me very much of what I call a Bucktown special, but the seasoning was very different, and amazing. The thing it has in common with a Bucktown special is that you use LOTS of napkins if you do it right. After I went to Rob’s and laid on the couch and moaned for a while, I went to Elastic for my first gig of the trip. The opening set was a solo percussion set from Tatsuya Nakatani. His solo stuff is really enthralling. The second set was a quartet with Tatsuya, Jim Baker on piano, Josh Abrams on bass, and myself. I was really quite curious about what would come out, with Josh, Jim and I coming from essentially jazz-ish backgrounds, and Tatsuya’s solo set was very much in a soundscape type place. It was all about subtleties of sound, and I play trombone…that’s not usually too subtle. It was great. The four of us found several places to meet, and the music was tons of fun to make. The people listening seemed to enjoy it as well. On Friday, the bulk of the day was spent rehearsing for the Lucky 7s concert that night. Our concert was at Kilbourn Park, and was part of the Jazz Institue of Chicago’s Jazz City series. What a great scene. It was a free concert in a park building. The only down side was that the park building it was in was a gym, so the acoustics were less than ideal. The sound guy was good, and it was the best sounding musical experience I have ever had in a gym, but it was still a gym. There were lots of people there, including many children, which I really love to see. Kids joyfully dancing to non-mainstream music is a sign that there is hope for society. The Jazz Institute does some really good work there in Chicago. I’d like to offer special thanks to Dan Melnick and Lauren Deutsch for making that concert happen. After our gig, Jeb was playing with The Engines at The Velvet Lounge. They sounded great. It was nice to just sit and listen to live music, without having to worry about playing the next set, or MCing, or anything. Saturday afternoon, Jeb and I spent some time dealing with mixing the new Lucky 7s material, if you can call stuff recorded last July new. We made some good headway, so there still is a chance that a new Lucky 7s CD will be out sometime this decade. Saturday night, I played my quartet book with my Lucky 7s colleagues Matt Golombisky (bass) and Quin Kirchner (drums), plus alto saxophonist Greg Ward, at a nice cozy space called Brown Rice. The venue records the shows, and the recording sounds great. I’ll post some excerpts at some point. I had never played with Greg before, and it was a blast. He is a great musician, and always did just what the music needed, even if I didn’t know the music needed that until he did it. If it is at all within my control, I’ll make more music with Greg in the future.